Members of the Tuareg community in Mali say a large number of men from the Tuareg ethnic group have left Mali in the last week to join pro-Gaddafi forces in Libya. "About 2-300 have left in the last seven days," said a senior elected official, who did not want to be named, from the Kidal region in the north of the country, where many Tuareg live. Another Tuareg man from Kidal said: "It's true many young men are leaving. It all started about a week back." He said he had spoken to people in a convoy of 40 vehicles who are in southern Algeria waiting to cross the border into Libya. The elected official said: "They are being paid about $10,000 (£6,000) to join up and then I've heard they are being told that they will get $1,000 a day to fight." The official claimed that some of the money was coming through the Libyan embassy in the Malian capital, Bamako. I contacted the embassy but was told only the ambassador could comment and he was sick. Ever since the start of the uprising in Libya there have been reports of Colonel Gaddafi using "mercenaries" to put down the protesters. Eyewitnesses have talked of Africans of darker skin firing on protesters, speculating that they might be coming from countries such as Chad, the Democratic Republic of Congo, Niger, Mali and Sudan. Some of these black African fighters have been in Libya for many years, however. Some have been in the armed forces for much of that time and some have taken on Libyan nationality. It is only in recent days that reports of people who fit with a more classic definition of "mercenary" have been coming to light and one of the places of recruitment is Mali. The Tuareg are a traditionally nomadic people who live in the Sahel-Sahara zone of north-west Africa. There have also been reports of Tuareg from Algeria and Niger making the journey to Libya. The Tuareg and Colonel Gaddafi have a long history. In the early 1970s, Gaddafi created his Islamic Legion. This was supposed to be an Islamic military force that would fight for a unified Islamic state in north Africa. Many Tuareg joined up, lured then too by the promise of cash salaries at a time when the Sahel-Sahara zone was experiencing a terrible drought. The Legion ended up fighting in places like Chad, Sudan and Lebanon but in the late 1980s it was disbanded. Many Tuareg stayed in Libya and joined the country's armed forces. 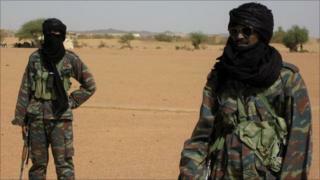 The other major link between the Tuareg and Col Gaddafi's government is the various Tuareg rebellions in the region. The Tuaregs in Mali and Niger have fought on and off for many years with their central governments, demanding greater independence or at the very least more investment in the areas they live. Col Gaddafi has been accused of supporting these rebellions. What is sure is that he has helped broker peace deals and offered sanctuary to former rebels when the fighting was over. It is these historical links that are now being called upon to get Tuareg to Libya. "There were people who took part in the Tuareg rebellion here in Mali who then joined the Libyan Army," the official from the Kidal region said. "These people have very good contacts, of course, to the Tuareg who stayed behind and they are now asking them to come to Libya." The Malian government has yet to make an official statement about the allegations. But a source at Mali's foreign ministry said: "The government of Mali is strongly opposed to the use mercenaries in any armed conflict and is not in any way facilitating the movement of these people. We're thinking at the moment about how we can stop this." Another Malian government official admitted the task was not going to be easy. "These people are travelling through the desert. Nobody controls the borders in the Sahara," he said. It is about two days drive from northern Mali to southern Libya. Many of the Tuareg who are leaving have experience either in the Tuareg rebellions, the Malian armed forces or the Libyan army. On top of this, some have been involved in smuggling drugs and people across the region. In any case, these days in the Sahara most men know how to handle a weapon. People often travel armed. The official from Kidal said the lure of huge salaries was just too tempting for young men in a zone where there are few other economic opportunities. "Even some of my own family have gone to fight, even though I've been begging them not to."